Ever since Apple’s Logic Pro bundled a huge library of synthesizers and effects into a DAW, its competitors have been gradually adding more instruments and sound processors. Even without Logic, the step is a pretty obvious one: there are only so many DAW features you can add from year to year to try to compel people to upgrade, so bundling extra sound toys is the other alternative. Mostly, though, SX4 looks inspired by Logic Pro. Internal audio mixing is remiscent of Logic’s Environment, though it may be easier to use. 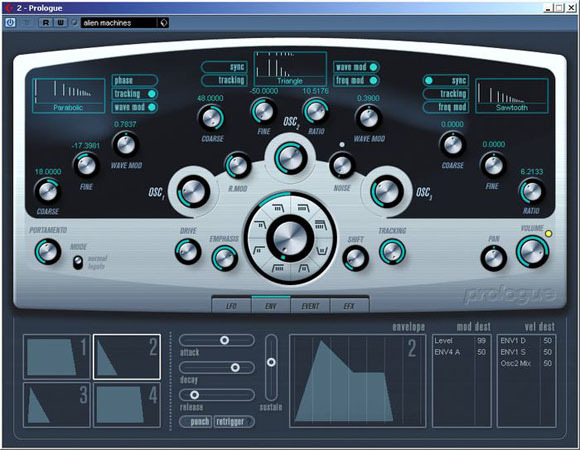 The interface for Prologue looks just like the ES2 to me, and the visual style resembles instruments like Sculpture, sometimes approaching a direct rip-off. (Then again, sometimes software looks alike because UI services are outsourced to third parties; I don’t know whether that’s happened here or not.) The synthesizers themselves look interesting, with some spectral processing and synthesis options. I don’t imagine it’ll make you switch to SX4, but it could keep Cubase loyalists from switching to something else. It’s just a glimpse, of course — it’s funny watching Cubase users pre-judge the entire SX4 upgrade based on some leaked, unofficial screen shots. I’d say take them as a small taste, and wait for the official stuff. Don’t expect the competition to stay still, either; aside from the imminent Ableton Live 6, I would expect Logic Pro to get a large update some time soon. Stay tuned. Jean-Jacques Perrey and Dana Countryman, Live in L.A.